If you were born a gearhead, Ralph Gilles is essentially who you wanted to be when you grew up. Like most of us, Ralph started drawing cars when he was young, unlike most of us he turned that passion into a job at Chrysler where he became a break out star following the design of the company's extremely successful Chrysler 300. From there they promoted him a few more times to his current job as President and CEO of the SRT Brand and Motorsports as well as Senior Vice President of Product Design for all of Chrysler. What does that mean? Right now it means convincing people to look at the 2013 SRT Viper, a task that only rivals persuading people to breathe oxygen instead of sand. 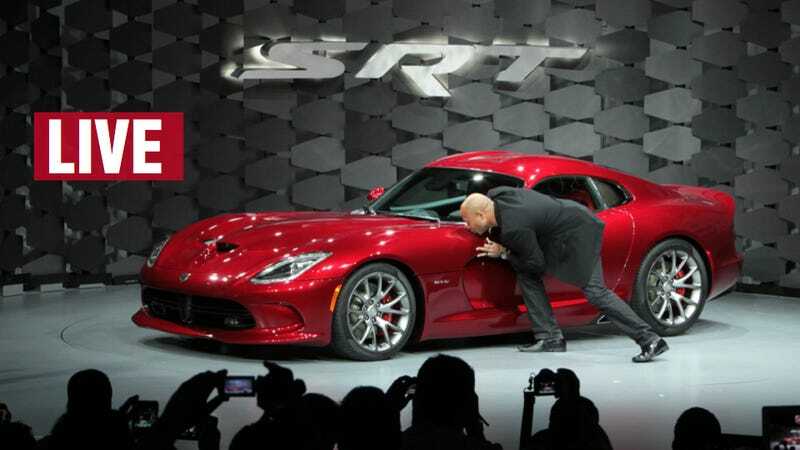 2013 SRT Viper: The Snake Is Back! Or, as he apparently put it, "The Viper exists so that Corvette owners can have heroes." He's answering your questions about the Viper and Chrysler/SRT in our discussion system below with a special guest. Fire away! A little more on Gilles. According to his official bio he's "extremely active." A bit of an understatement when you consider he manages to be an auto exec while simultaneously finding time to race in One Lap, drive a car in the Newfoundland Targa, toss Vipers around, and serve on the board of the Walter P. Chrysler museum. Chrysler Recreates Vanishing Point Challenger For One Lap Of America, Cleavon Little Says "Yaahhhh!" He also has an MBA from Michigan State, which explains our former editor's man crush on him. Or maybe it's just the large collection of pro-Detroit shirts Gilles seems to own. Joining Gilles today is Beth Paretta, director of SRT Brand and Motorsport Marketing Operations. A lifelong racing enthusiast, Paretta is responsible for all SRT marketing, strategy, operations and dealer development, as well as marketing strategy and activations for SRT Motorsports. Did we also mention she's taller than Felipe Massa? UPDATE: Big thanks to Ralph Gilles and Beth Paretta for answering so many questions and with such humor! They're now off to make more crazy fast Chrysler products, but you can see their responses below.